100 Amp EV rating. 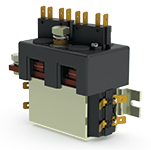 DC 88 motor reversing type contactors have been designed for direct current loads. Monoblock design resulting in a compact package. Single pole double throw configuration. Applications include electric vehicles, material handling equipment, industrial winch applications. 100 Amp EV Rating DC88P version is sealed, compliant to IP66 rating. Monoblock design. Motor reversing type contactor. Single Pole Double Throw configuration. Applications include, marine winches, EV’s, material handling equipment. 100 Amp EV Rating DC88P-1000 motor reversing type of contactor, are designed for direct current loads. They are “P” rated, Compliant to IP66. Single Pole Double Throw configuration. Designed for marine winches, hoists, EV’s and Industrial trucks. 100 Amp EV Rating. (2x SW80). DC92 series is a monoblock design, very compact style DC contactor, rated at 100 amps. Continuous and is suitable for switching inductive, resistive, and capacitive loads. Applications would include light industrial trucks, and small EV’s. 100 Amp EV Rating. (2x SW80, mono block configuration) The DC92P version is sealed, compliant to IP66. Ideal for marine environments. Applications would include, EV’s, industrial trucks, most marine type environments. Silver tin alloy contacts. Available in DP/NO, DP Changeover, DP/NC,	Paired DP/NC versions. Designed for use with direct current loads, especially on motors as used on electric vehicles such as industrial forklift trucks, aircraft tow tractors, etc. 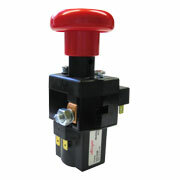 Rated at a continuous current of 150 amps DC for severe switching, 200 amps for light duty switching applications. They are available in SP/NO, DP/NO, SP/NC types. Designed for direct current loads on larger electric vehicles, airport tractors, industrial trucks. Also used as LVD''s in static power systems for protecting the system batteries. Designed for use on larger higher current electric vehicles, industrial trucks, etc. Additionally, for use on static power systems as a LVD for system battery protection. Curtis/Albright relays are DC contactors designed to energize or isolate the vehicle lights, electrical pumps, fans, heating elements, solenoid valves, etc., by meansof the key switch. Curtis/Albright Main Power/Ignition Relays areeminently suitable for controlling the electrical services on heavy duty construction, forestry andagricultural vehicles and machinery. This series of bus bar mountable DC contactors is designed for use in static power systems as LVD's for system battery protection. Albright International announces a new addition to the ED & SD ranges of Battery Disconnection Switches: SD200 – This replaces the SD150 series. 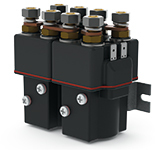 The SD200 combines the dual function of a manual disconnect and coil operated line contactor. The benefits of this design include compact size and reduced installation costs combined with an electrical capacity sufficient for most small and medium size electric vehicles. Albright International announces a new addition to the ED & SD ranges of Battery Disconnection Switches: SD300 – This replaces the SD250 series. 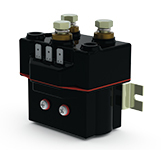 The SD300 combines the dual function of a manual disconnect and coil operated line contactor. The benefits of this design include compact size and reduced installation costs combined with an electrical capacity sufficient for most small and medium size electric vehicles. Replaces the previous SW280. Designed for high current applications. 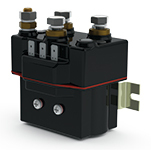 This freestanding compact contactor follows the established and innovative designs of Albright products. The following features are available on this new range of contactors. 100 Amp EV Rating/ 125 Amp Static Power System Rating The SW80 version is a Single Pole/ Single Throw DC contactor, rated for 100 amps-(Frequent Switching applications), and up to 125 amps continuous, rated for light switching applications, i.e. Telecom, static power systems, etc. Applications would include, static power systems, Telecom PDU’s, battery chargers, EV’s, industrial trucks. 100 Amp EV Rating/125 Amp Static Power System Rating. Single Pole Single Throw configuration. Is the sealed version, compliant to IP66. Ideal for marine environments. Applications would include, EV’s, Industrial trucks, static power systems, marine applications, bow thrusters, etc. 100 Amp EV Rating/ 125 Amp Static Power System Rating. Double Pole Single Throw, Normally Open configuration. The SW82 version is fitted with Double Pole main contacts, rated for 100 amps continuous. Designed for use on EV’s, static power systems-i.e., battery chargers, industrial truck applications. 100 Amp EV Rating. Paired Double Pole Single Throw configuration. The SW822 has been designed for motor reversing applications with direct current loads. Designed for use on EV’s and industrial trucks. 100 Amp EV Rating. Paired Double Pole Single Throw configuration. The SW822P is the sealed version, compliant to IP66 for marine type environments. Designed for use on marine, EV and industrial truck applications. 100 Amp EV Rating/125 Amp Static Power System Rating The SW82P is the sealed version, compliant to IP66 for marine type environments. Double Pole Single Throw, Normally Open configuration. Designed for use on EV’s, industrial trucks, battery charging systems, marine applications. 100 Amp EV Rating/125 Amp Static Power System Rating The SW84 version is a single pole, double throw configuration. Designed for use on motors, EV’s, industrial trucks, etc. 100 Amp EV & Static Power System Rating The SW85 version contactor is a single pole, double throw configuration. Designed for use in static power systems, EV’s, industrial trucks, etc. 100 Amp EV & Static Power System Rating. Single Pole Double Throw configuration. The SW85P version is sealed, compliant to IP66. Designed for marine, EV’s, industrial trucks and static power systems. 100 Amp EV Rating The SW88 version is a single pole, double throw configuration. Designed for EV’s, industrial trucks, etc. 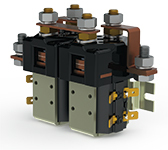 100 Amp EV Rating The SW92 version contactor has been designed for direct current loads. It features double breaking main Contacts, along with its very compact mono block design. Typical applications are, small electric vehicles, light industrial trucks. Rapid disconnect of batteries or other power supplies in the event of emergencies. Battery powered vehicles of all types. Static power systems. 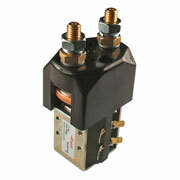 Fill the gap between 30 amp relays and 100 amp contactors. PC 60 for printed circuit board. SW 60 for free standing contactors. 80 Amp Miniature Contactors and Solenoid switches. 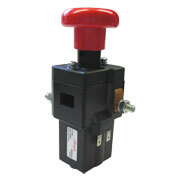 Rated for 100 amps in severe switching applications and 125	amps in light duty switching applications. Compact size,	consisting of versions such as SP/NO, DP/NO, SP/NC. This series has been designed for light duty electric vehicle motor loads, mobility aid carts, light duty industrial truck applications. Additionally designed for use in static power systems as an LVD for system battery protection.